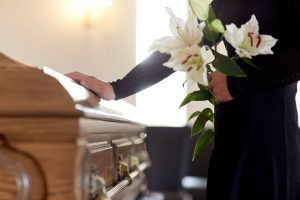 Sympathy flowers are a visual expression of mourning, respect, and love when it comes to honoring the death of a loved one. The white lily is perhaps the most popular flower for funerals because of its symbolism for innocence, purity, and majesty. What’s more, the stargazer lily represents sympathy. Traditional lilies may be some of the best flowers for funerals, but it’s also nice to honor the life and personality of the deceased. Therefore, here are a few non-traditional funeral flowers that are just as meaningful to consider for your loved one’s funeral service. Sunflowers are a spirited and bright flower that are a favorite of many Americans. As a symbol of adoration, longevity, and happiness, these flowers are a great way to symbolize the love that characterized a person’s life. Sunflowers are also a great way to bring a smile to a mourner’s face as 69% of Americans report the sight of flowers improve their mood. Protea is a versatile, ancient flower that can be paired with a variety of bouquets, which is what makes it one of the best flowers for funerals. These flowers represent transformation, courage, and diversity, which makes them a perfect flower for the passing of a strong and courageous loved one. Additionally, the protea’s symbolism of transformation can be applied to a variety of religions and cultures. The white anemone is a beautiful and delicate looking flower often used in fall and winter bouquets. These flowers are also exceptional for funerals because of the legend surrounding their creation. According to Greek Mythology, the anemone grew as a result of Aphrodite’s tears as she grieved for Adonis. What’s more, the anemone is said to provide protection against evil and to bring luck. The delphinium is often used as a supportive flower in a funeral bouquet, but it can also make an incredible statement on its own. With such a vibrant blue color, the delphinium is a wonderful choice for the deceased who loves blue. Additionally, the delphinium also signifies dignity, renewal, and youth. The sweet pea is a beautiful flower that comes in a variety of colors to suit any bouquet. Their unique shape gives a unique and enchanting edge to sympathy flower arrangements. What’s more, these small flowers represent departure and goodbyes, making them truly a sentimental and moving funeral flower option. When it comes down to it, the best flowers for funerals are the ones that speak to you, your family, and your deceased loved one’s tastes. For more funeral bouquet ideas to honor the life of your loved one, contact Open Blooms today.